Liczba stron: 27 Jest to ujednolicona liczba stron, która ułatwi Ci porównanie długości książek. Każda strona Legimi to 200 słów. When Miles Puggsley spends his last dollar on a carton of empty eggs, he realizes he's reached rock bottom and the end is near. But there's a basement to the misery he now endures, especially for the once proud DMV specialist turned exorcist. Can a band of wild chicken farts change his fortune? No, probably not. Approximately 4,100 words. © 2018 Donald Rump. All rights reserved. Image(s) licensed by DepositPhotos.com and © Piotr Stryjewski (#44105603). Fart drawings by Mel Casipit. Ever had an egg? If you’re an old fart like me with all this extra blubbery fat oozing off the sides and XXXL derriere, then of course you have! But have ever cracked one open, only to find that there’s no yolk inside, just the smell of a would be chicken, the ghost of chicken past, wrapped up into one incredibly stinky orb of air? I’m sure all of us have had this weird phenomenon happen at least once in our lives. You got all of the smell but none of the chicken! And for some reason, the smell is that much harder to get rid of, prompting you to toss out your garbage a day early. But even that’s not sufficient, is it? Why does this sort of thing happen? Despite what you might think, you really did get your chicken. Was the eggshell half empty or half full? It was completely empty, or so you thought. 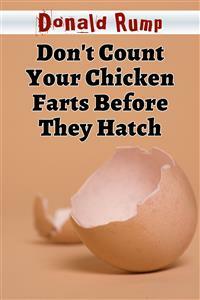 Yet the chicken fart lived on in ways your wee brain couldn’t comprehend. What’s going on here? Well, the chicken, in fact, is real. Its body, however, is in another place--another dimension!